Van Leeuwen Artisan Ice Cream began as a truck, but opened their first brick and mortar shop in the Arts District in November of last year, offering flavors such as pumpkin pie, mocha and donut, and a vegan matcha green tea. Westbound opened in May, and is inspired by La Grande Station, which became defunct after the opening of Union Station in 1939. 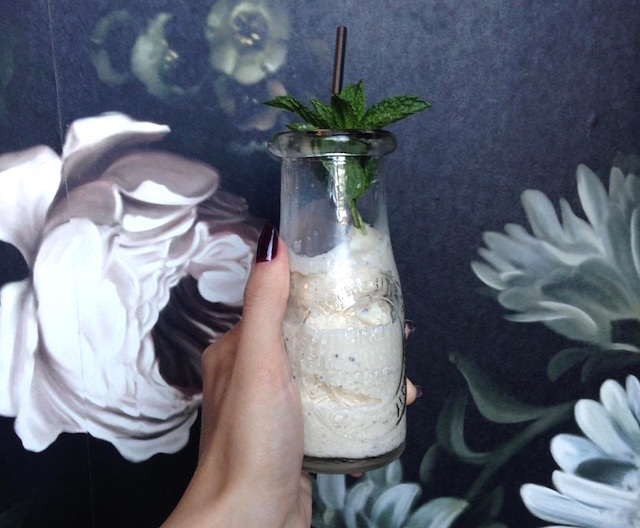 For the month of August, the two neighbors at 300 Santa Fe are collaborating on three boozy shakes crafted by Westbound bartender Dee Ann Quinones using great spirits and Van Leeuwen&apos;s tasty ice cream. You can get The London Fog, made with Earl Grey ice cream, house-made lemon sorbet, Beefeater gin; the dairy-free Matcha Madness, made with vegan matcha ice cream, Rittenhouse Rye, honey syrup, Amaro Montenegro and matcha powder; or the Grasshipster, made with mint chip ice cream, fernet branca, creme de cacao, creme de menthe, and mint. We prefer the taste of the Grasshipster, a creamier play on the classic Grasshopper dessert cocktail. However, you really can&apos;t go wrong with any of them. They&apos;re the perfect answer for when you can&apos;t decide if you&apos;d rather go for a drink or dessert, and Westbound&apos;s sunny patio or train car-style booths are a pleasant setting for a treat.